BELLE TERRE Estate. One requires a romance language such as French to properly describe this “Beautiful Land” located at 2547 McConnells highway in Rock Hill, SC. 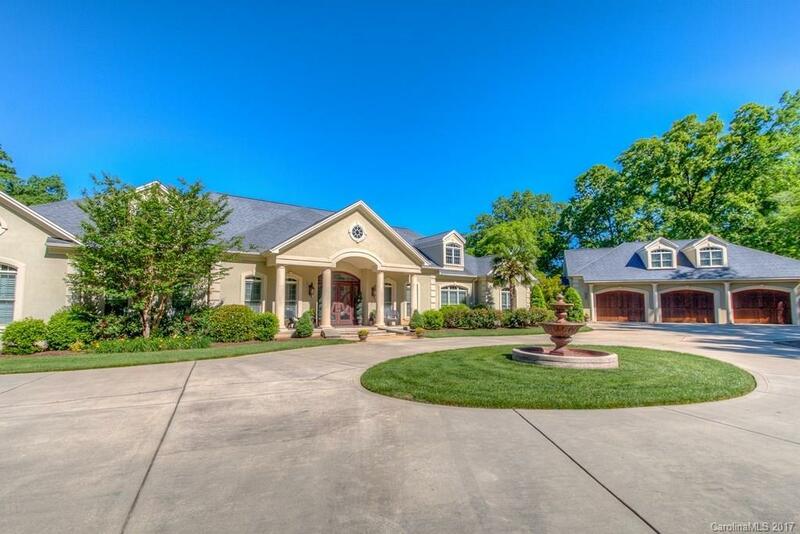 Situated in the Catawba River valley in piedmont South Carolina, this estate could just as easily be found in the Loire Valley. The instant you pass through the gated entrance there is an “Old World Estate” feeling; mature, pristine landscaping including walls, terraces, private pond, fountains, circular drive and an auto court greet visitors with a European flair. That feeling is not dissuaded approaching the double mahogany front doors through the column-lined portico. Upon entering the foyer your senses are assaulted with elegance, grace, and quality. From this entrance, the sightline transports you through the foyer to the Great Room and beyond to the patio and pool. A quick scan of your initial surroundings confirms the first impression of this home; multiple fireplaces, vaulted ceiling with gracious chandeliers, extensive crown molding, wainscoting, ceiling fans, columns, arched entrances; it was truly designed, built and maintained with care and concern. The foyer is flanked by the office and formal living room, both with fireplaces; double glass arched doors mark the office entrance. The opposing living room is just one of the places in this home to escape with your thoughts or a book. Included in the office is a hidden room for files and valuables; one more unique touch in this special home. Ahead, the Great Room offers a fireplace bordered with large built-in cherry cabinets and bookcases. The “wall of windows” and French door takes you to the large patio/pool and gracious indoor-outdoor living, including a pergola over a section of the patio and a covered porch. From the Great Room one can also access the kitchen and accompanying keeping room. Equipped with Viking appliances, the gourmet kitchen can accommodate a large gathering or a peaceful breakfast at the breakfast bar, followed by coffee and paper in front of the keeping room fireplace. Hardwood floors, maple cabinets, granite countertops, wine rack, stainless appliances, double oven, gas cook top, classic carved exhaust hood, pot filler, cooler drawers and walk-in pantry again speak to the quality and efficiency of this room and this home. A split floor plan provides added privacy for the Master Suite, which includes a large bedroom with fireplace, exercise room, attached sun room overlooking the pond and gardens; bathroom featuring spacious shower, Jacuzzi tub, stained glass bay windows, private water closet, two vanity sinks and makeup vanity; two separate closets each with built-in cabinets and shelving, and wet bar. A formal dining room, a jumbo laundry room and guest rooms with individual bathrooms, complete the main house. A finished, sunny breezeway; a perfect place for your plants, transports you to the oversized 3-car garage, with a closet, garden room and tool storage room. A stairway from the garage takes you to the bonus room or apartment with kitchen space, full bath and balcony overlooking the pool/patio area. The grounds and outbuildings on this estate are just as impressive as the main house. From the main house, travel on an access road through a hardwood canopy to a large equipment shed; used to park vehicles and store excess materials. The shed has electricity and has an off-road diesel fuel tank. Past the storage shed, and facing one of the large, lush fields is the barn/workshop. A multi-purpose building with two lower level rooms and upstairs loft, concrete floor, full bath, separate HCAC system, workbench and a 2000 lb. electric ceiling hoist on a sliding rail; this building could serve countless uses. A lifetime of experience, intricate planning, attention to detail, and unwavering superior property stewardship clearly sets this estate apart. BELLE TERRE; it is a beautiful land and lest one becomes absorbed with the home and buildings, a walk around the pond and across the rolling fields framed by wood lines and streams will surely reinforce the natural beauty and man’s complement to that. Come see the Beautiful Land; come experience BELLE TERRE.